What Does ABO Board Certification Mean? a new generation in orthodontic care! At Decoteau Orthodontics, we believe that a healthy, beautiful smile enhances your feelings about yourself. When you feel confident, you are able to be your brightest and best self. And when you shine, you are better able to create an amazing life for yourself. This is the driving force behind what we do at Decoteau Orthodontics, where we create brighter smiles for brighter futures! For more than 30 years, Decoteau Orthodontics has been dedicated to providing children, teens, and adults an orthodontic experience that makes you feel special, from the moment you first arrive until you “graduate” with the smile of your dreams. You become a member of our orthodontic family, and while we pride ourselves on providing exceptional orthodontic care using state-of-the-art techniques, it’s the bond we form with our patients that is most rewarding. My daughter just got her braces off and WOW what a beautiful smile!!! Dr. Decoteau and his staff have done a wonderful job and have made our "braces experience" as easy as possible. I especially love the atmosphere in the waiting room. It's like an after school party. Click here to view all of our Google reviews. 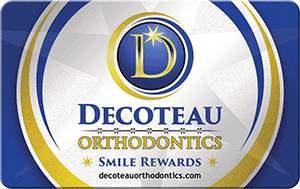 Decoteau Orthodontics is a great practice. I feel like all the staff there are my friends because they are very nice and talk to me while they are working on my teeth. I look forward to going there every time i have a appointment because of the nice people and the awesome energy in the practice. I definitely see a big improvement in my teeth since I started going there. My boys love this orthodontist and the staff. He treats you as if your child is one of his own! Decoteau Orthodontics is such an amazing place. the staff is friendly and helpful, and have made the whole experience very easy and enjoyable. Patients can now connect with our office on the Patients Rewards Hub where they can earn rewards. prizes and more. Click on the card to the right and sign in to learn more about our Rewards Hub! The American Association of Orthodontists recommends that every child should be seen by an orthodontist by the age of 7. This doesn’t necessarily mean that treatment will begin then, but we will be able to monitor your child’s growth and development in order to be ready to start when the time is right. 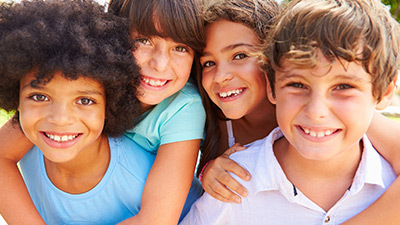 We invite you to bring your child in for a complimentary orthodontic evaluation! Every teen is unique, and it’s important that they receive personalized orthodontic care for their individual needs. We have a variety of options to choose from, including Invisalign teen, colored braces, and clear braces. For teens, orthodontic treatment is now easier, more comfortable, and results in an amazing new smile! If you think you’ve missed your chance to have beautiful, straight, healthy teeth, think again! Braces are for people of all ages. We’ll enjoy working with you to plan your orthodontic treatment, and now are able to offer Invisalign clear aligners and clear braces for virtually invisible orthodontic treatment. We offer the convenience, privacy and comfort that’s important to our adult patients. Why is Decoteau Orthodontics The Right Choice For You? As board certified orthodontists, straightening teeth is our expertise! Dr. Decoteau and Dr. Ferrick have years of experience creating beautiful, healthy smiles for children and adults with braces and Invisalign. We will treat you as if you’re a member of our family. We offer flexible payment plans, low down payments, and interest-free financing to help our fees work with every budget. Our affordable financial plans will give you something to smile about! Our Groton and Nashua orthodontic locations offer convenient hours to fit your schedule. Life is busy, so we offer office hours to help you enjoy your life while creating your beautiful smile! We are invested in our Groton and Nashua communities. Your interests are our interests, and we are honored to be involved with and sponsor schools, sports teams, clubs, and charities in the Groton and Nashua area. Excellence in orthodontic care requires utilizing state-of-the-art diagnostic tools (digital x-rays), treatment techniques (removable aligners), and sterilization procedures. These cutting-edge practices maximize your comfort, health, safety, and beautiful smile! We love our patients, and they love us too! We enjoy getting to know our patients and their families, and love sharing the special moments in our patients’ lives. We are honored by the amazing reviews people write about us on Google, Yelp, and Facebook. Yes, we provide exceptional orthodontic care, but we also strive to do so in an atmosphere that is kind, compassionate, respectful, and fun! We provide customized orthodontic care with a focus on what makes each patient unique and special. Amazing Reviews from our extraordinary patients! ” I highly recommend Dr. Decoteau. He and his entire staff are not only extremely good at what they do, but they are the most caring and friendly group of people you could ever hope to work with. I am so thrilled with my results and am thankful to Dr. Decoteau for giving me a dazzling smile.” – Renee G.
Thank you for visiting our website. We hope it gives you a sense of what makes our team at Decoteau Orthodontics uniquely capable of providing your orthodontic care with personal attention, expertise, and professionalism. And if you still have questions, please call our office. We are eager to hear from you, and hope you’ll schedule a complimentary consultation for yourself or a loved one today! The highest tech care is only as good as the experts who use that technology to design the right treatment for you. We customize treatments specifically for each patients, there is no one-size, cookie cutter approach. Decoteau Orthodontics offers the most effective orthodontic treatments available with financing which makes it more affordable than ever before. We create beautiful smiles for kids, teens and adults in and around Groton, MA, Ayer, MA, Pepperell, MA, Nashua, NH, Hollis, NH, and Litchfield, NH. Dr. jay Decoteau and Dr. Caroyln Ferrick offer the most advanced braces for children, braces for teens and adult braces, including; metal braces, clear braces, Invisalign for adults, Invisalign for teens, and more. In Groton, Call: (978) 448-2300 In Nashua, Call: ((603) 589-9222 FREE Consultation for braces or Invisalign at our Groton or Nashua Offices Orthodontist office.